In this episode of Limited Engagement, we do a mock conversation on developing a new map concept and flushing out it’s mechanics. Note: This is not a complete design document. 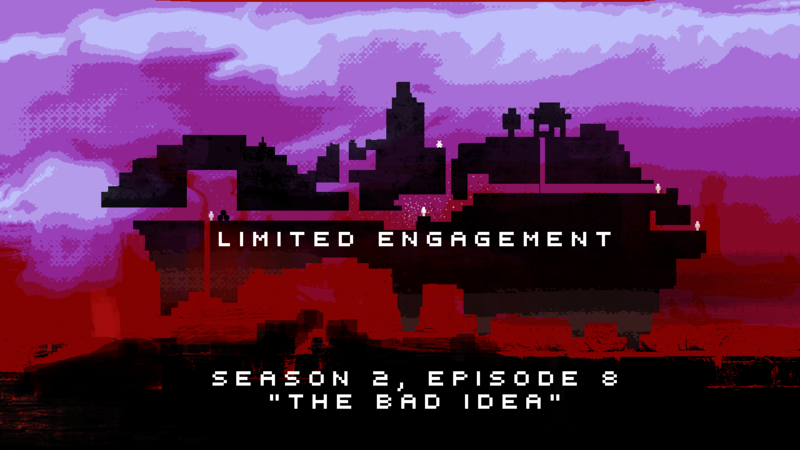 There are notes from the project development session that took place on the 8th episode of Season 2 of the Limited Engagement podcast. If you would like to work on this project, it is highly recommended you use these notes to develop a more thorough and complete design document to work from. It should also be noted that this game idea belongs you, the Limited Engagement community, and you should feel comfortable in adding, changing, or discarding any of the ideas presented. We know you’ll make something awesome. Players spawn in a suburban house. After choosing who’s “it” (or being chosen at random), the players leave the house and gather around the area that will become “base” (car, tree, etc). The player designated as “it” is temporarily blinded (or teleported to stare at the ground). Meanwhile, the surrounding suburban neighborhood begins to transform into another world. Several maps should be made and picked at random (or selected in the pregame phase in the house.) Players run into the map and find places to hide. Nametags are turned off. After a period of time, the player who is “it” is released. The “It” player has a set time to locate all other players and punch them to capture them before time runs out. When a player is punched, they are teleported to “home base,” which serves as a prison. The first captured player instead becomes the second “it” player, who can either stay at home base and guard prisoners, or leave to hunt for other players. Captured players are stuck at home base until another player manages to reach home base and tag them by punching them. After being released, the player receives a short period during which they cannot be captured or release other players. Every interval of some seconds, all non-“it” players in home base are teleported into a “chore” – a random minigame which players compete to spawn a powerup for other players at a random location in the map. The powerups spawned are directly related to the chore completed. These powerups cannot be picked up by “it” players. When a powerup is spawned, its location is announced in the chat for all players (including “its”) to see. When players fail to complete a minigame (or no players are captured at the time of the chore), a powerup spawns for the “its.” Game ends in victory for the “its” if they capture all players before the game time runs out. Game ends in victory for the non-“its” if time runs out with at least one player not captured. “Take out the garbage.” – Steal a “garbage bag”: a throwable item which creates a sticky, slowing mess around its location. “Do the dishes” – SOAP IN THE EYES! Blind an opponent temporarily. “Mow the lawn.” – Cover yourself in grass clippings to gain temporary invisibility. “Scrub the toilet.” – Get Squeaky Clean! slip away from the opponent with your temporary speed boost. “Clean the garage.” – Oh hey, there’s Grandpa Gerald’s teleportation device! He’s been looking for that. Teleport to a random location within a radius around you. “Hey, I think that kid had some chocolate on him..” – Path appears leading to nearest player. Path disappears after a short time and does not follow targeted player if they move after path appears. “Radar” – Uses new captions feature to briefly show the direction of all players.